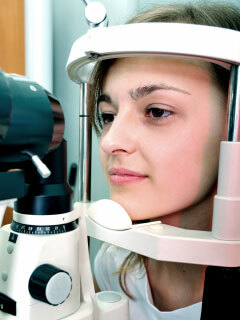 The first thing we want you to know about the eye exam at EyeCare Plus is that we care. We want you to leave our office knowing that your problems have been taken care of and your questions have been answered. We want you to know that we do have the latest equipment such as computer driven auto-refactors, corneal topographers, computer-imaging biomicroscopes, the latest in visual-field testing, etc., but even more important is that we have two ears. We use them. We take the time to listen. We have over 11,000 patients in the Peachtree City area. We haven't made everybody happy, but we've come close. The comprehensive visual exam at EyeCare plus includes visual acuity testing, refraction, binocular vision testing, visual field, tonometry (check eye pressure), cataract and glaucoma screening, internal health, and external health. I also check to see how well the eyes focus on near and distant objects. The exam concludes with a review of the findings and recommendations for continued visual well being.